Keep out of the heat. Avoid going out and engaging in strenuous activity during the hottest time of day, stay in the shade, do not leave children or animals in parked vehicles and, if necessary, spend 2–3 hours of the day in a cool place (such as an air-conditioned public building). While taking care of yourself, plan to check on family, friends and neighbours who spend much of their time alone. 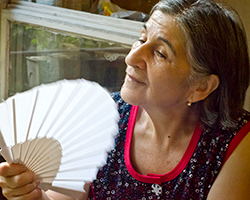 Vulnerable people might need assistance on hot days. If anyone you know is at risk, help him or her to get advice and support. Consult your doctor if you feel unusual symptoms or if symptoms persist. If someone has hot, dry skin and delirium, is experiencing convulsions, or is unconscious, call a doctor or an ambulance immediately.